After an email flurry between the camps of Democratic incumbent Dr. Ami Bera and his Republican Challenger Sacramento County Sheriff Scott Jones, the two candidates yesterday agreed to at least one debate. 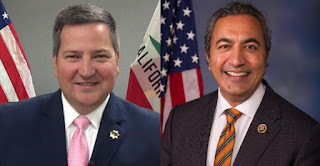 Jones is challenging incumbent Bera for the hotly contest Seventh California Congressional District that includes Elk Grove. About two months ago Jones' campaign challenged Bera to hold a series of debates in the lead-up to the November election. Following Jones' challenge, the Bera campaign had not publicly responded to Jones' proposal. Yesterday, the Jones' campaign re-issued its challenge to Bera seeking several debates throughout the district. Yesterday's email from Jones was titled "After 56 Days of Ducking Debate Requests Sheriff Scott Jones Slams Bera." Though it is not known if yesterday's challenge was the catalyst, less than two hours later the Bera campaign did respond, although not directly to the Jones' letter. The Bera campaign issued an email saying they accepted an invitation from Sacramento Public Broadcasting affiliate KVIE to participate in a debate hosted by that TV station. Less than three hours later, the Jones' campaign affirmed they too accepted KVIE's debate invitation. Not surprisingly, the Jones campaign tried to raise the stakes and re-amplify their first challenge to Bera. While the Jones' campaign has taunted Bera with the debate challenge, the Bera has campaign has likewise started a taunting campaign on Jones. The Bera campaign has used what could be a useful lever against Jones - Donald Trump. Starting with his comments to the Sacramento Bee in May that he would support Republican Presidential nominee Donald Trump, Jones has been bludgeoned with that comment by the Bera camp. On Monday, Jones told the Bee that "I don't know" if he will continue his support of the increasingly unpopular Republican Presidential nominee. For month the Bera campaign has attempted to paint Jones into a corner on his varying comments of support for Trump. This is occurring as dozens of nationally prominent and elected Republican officials have condemned Trump as being unfit to be President. . The Bera campaign took Jones to task on Wednesday for one of Trump's kerfuffles this week about the Second Amendment and his Democratic opponent, Hillary Clinton. In the context of the Second Amendment, Trump vaguely suggested that gun rights activist could stop Clinton from appointing Supreme Court Justices if she is elected.